33ft. Aqua Star Boat 320.H.P. Cummins engine. Fully llicensed and insured. All modern safety gear toilet and cooking facilities aboard. Prices from €60.00 per person per day Angling Charter. Full days angling charter €375.00. Sight seeing trips - rates also available. 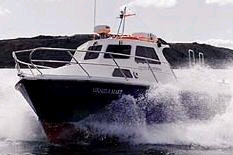 We are members of the North West Charter Skippers Association which formed to enhance and develop Sea Angling in the North West of Ireland through the promotion of a fleet of licensed insured and fully equipped vessels providing a high quality service in Sea Angling Charters.